My husband and I are still pretty new to owning a home, so we haven't acquired much in the way of holiday decor just yet. I have tons of stuff left over from my too cool college days, but none of it really fits our tastes anymore. Since we are still working on purchasing regular everyday decor for our home, we don't have a huge budget for seasonal decor. 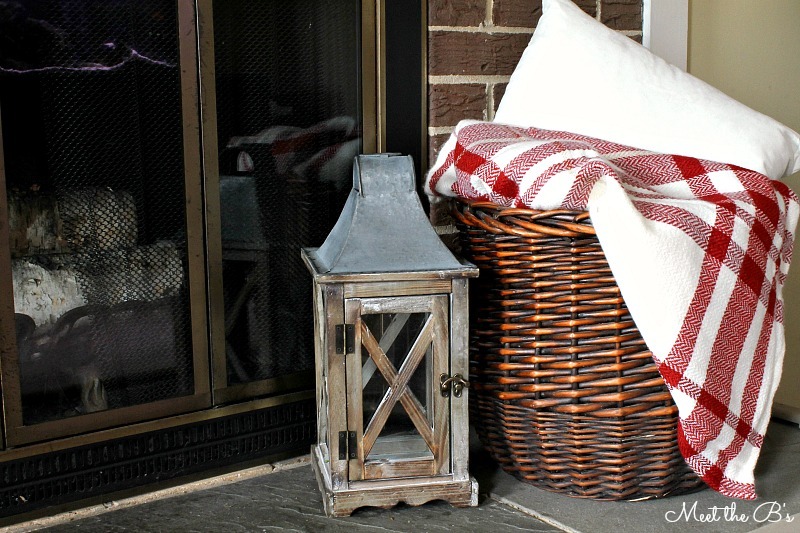 So, everything we have on display this year is either budget friendly, hand-me-down, or DIY! Let's take a look! Our entryway was kept pretty simple. I bought that handsome deer at Michaels this year at 60% off (gotta love their deals! ), and the cute little snowman box actually housed some snowmen ornaments my mom purchased years ago and she let me keep the box. I just think he's so cute! Next we move into our living room where most of the holiday decor resides. 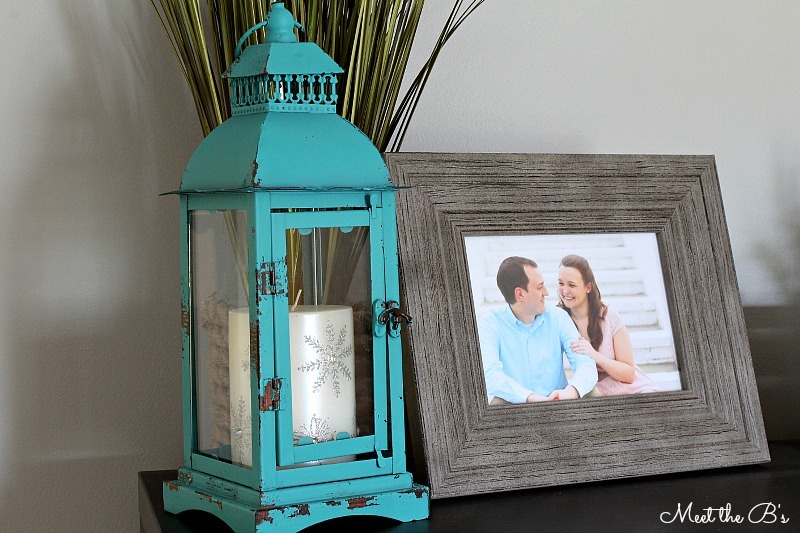 I already had this lantern on our entertainment center. I swapped out the candle for a sparkly snowflake candle I purchased at Kohl's on clearance a few years back. 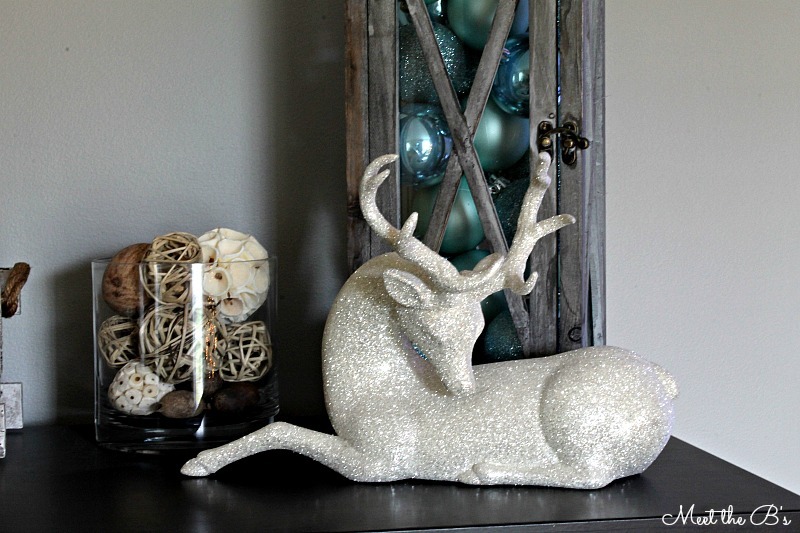 If you wait until the end of the season, Kohl's has great deals on holiday decor! The next corner of the living room has our Christmas tree! It's full of red, white, silver, gold, and wood ornaments. Most of the ball ornaments again are plastic ones from Walmart for $5. I have also made many of the ornaments, including my wood slice ornaments and feather boa ornaments. The rest I have slowly accumulated over the past few years on clearance or from affordable places like Ikea. My mom also gives us an ornament as a gift every Christmas. We've also received some ornaments from our childhood from both of our parents. I love how personal our tree is. It tells a story and reflects a picture of us! Here's one with the lights on. Pardon the cat. She refused to be woken from her nap :) You can see how I made her crate pet bed here. We also have this little mini tree in the living room which is very similar to our big tree as far as ornaments go. The tree itself was a gift to me years ago. When I was in high school, one of my best friends forever decorated this tree, decked it out in pink and silver ornaments, and left it on my front porch to surprise me! So sweet! Well, I'm not as passionate about pink as I used to be, so I swapped out the pink ornaments for red and left everything else the same. This tree still makes me smile at the memory of an amazing friend all these years later! That little reindeer candle holder and red glittery candle also came from a Kohl's holiday clearance sale! On to the dining room! We still don't have much everyday decor in this room, so we just added few things to spruce it up for Christmas. This giant ornament is a hand-me-down that my mom gave me. 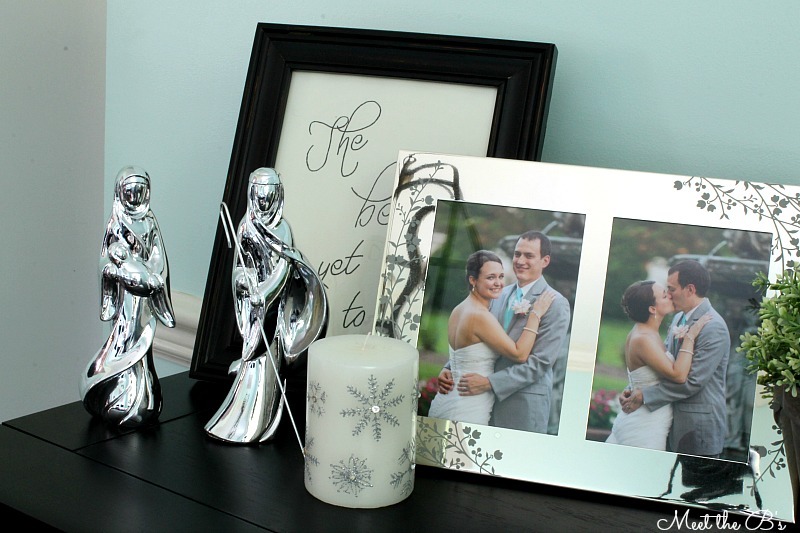 There's another Kohl's clearance candle, and the silver nativity set is also a hand-me-down from my mom. They go nicely with our silver frames! Last, is our formal living room. 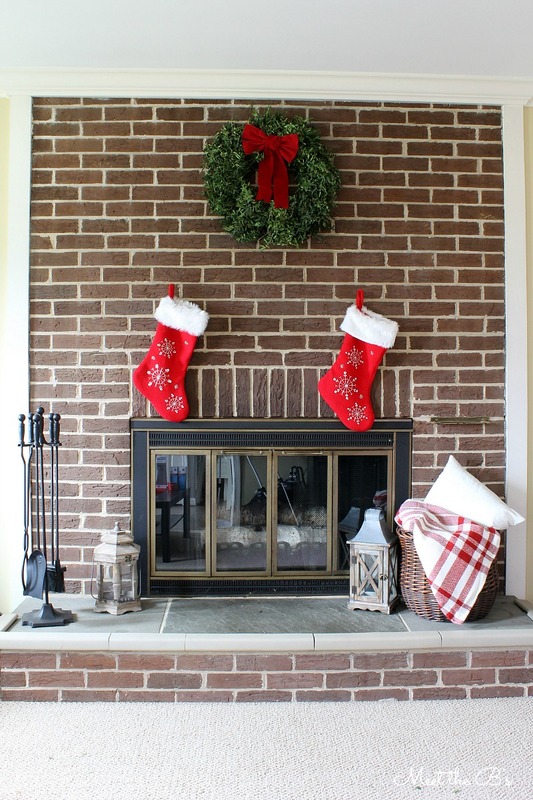 We don't really use this room much, but it is home to our fireplace so we wanted to decorate that area! We don't have a mantel, so we used fishing line to hang our stockings. The stockings were purchased from Target on sale a few years ago. The wreath is a live boxwood wreath from Home Depot. The red and white blanket was purchased from Target and is oh, so cozy! As you can see, holiday decor does not need to be expensive! Shop the sales, do a little DIY, and work with what you have! Thanks for stopping by! Please browse around the rest of the home tours below! 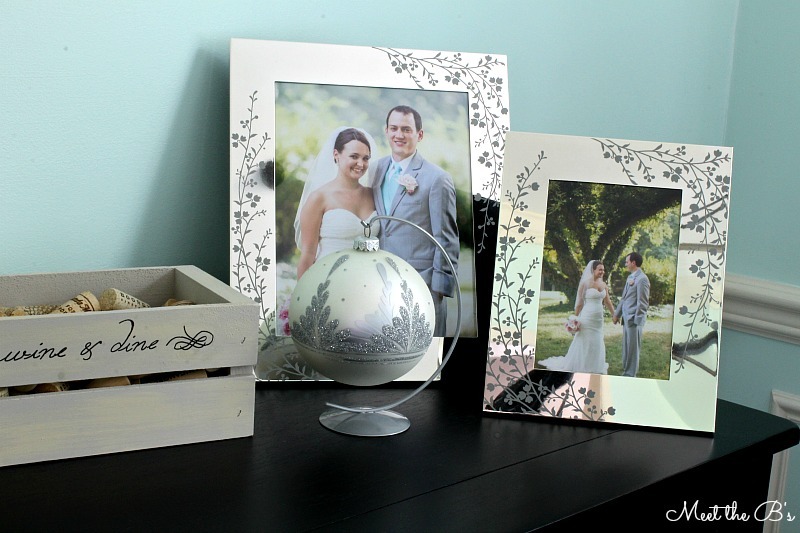 See more holiday inspiration here at Meet the B's! So lovely and elegant! And I don't blame the cat, that bed is awesome! Thank you, Karen! She loves her bed!!! Thank you, Christine!!! The cat crate was a fun project to make! Very nice! 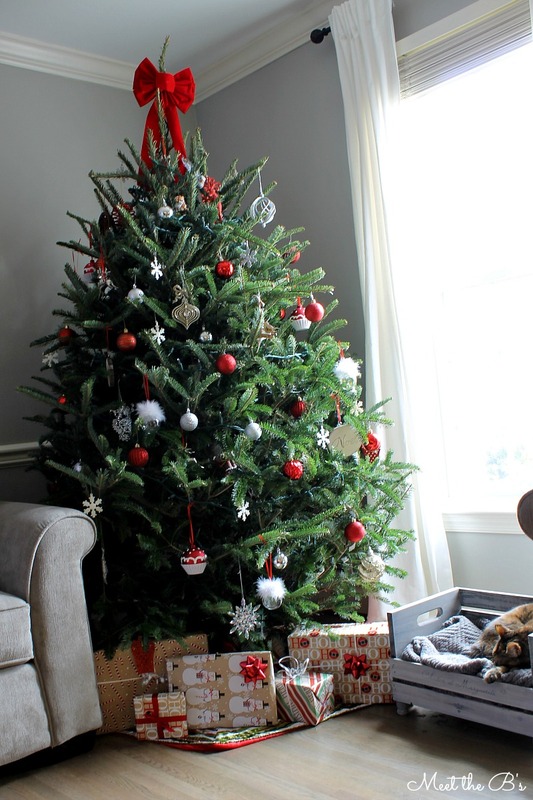 I love all your little touches around the house, and your Christmas tree is gorgeous! So happy to be with you on the Holiday Home Tour! I love all your pretty Christmas touches. I'm all about the budget-friendly aspect too. Your tree is pure perfection. I love the simple beauty of it. So glad to be a part of the tour with you! Thanks Nici!!! I love simple decor! Very beautiful tour Nicole!! 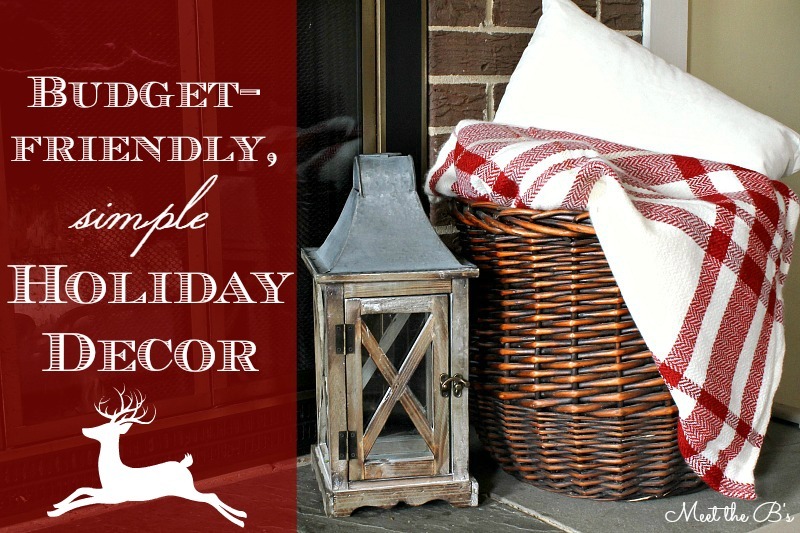 You definitely don't have to break the budget to have a beautiful home this time of year! LOVE all of your decor! And that little tree will always be special - what a great idea! Thank you Lindi! I will keep that little tree forever! One of my favorite gifts I have ever received. Your tree is perfect! Love the glitter reindeer and that red/white blanket in the basket!! I love your house. So cute! That little tree matching the big tree is the cutest thing EVER! Your kitty looks so comfy snuggled up in her bed! Your tree is beautiful, and I love the ornament on that little stand/hook. So Beautiful Nicole! Your Tree is AMAZING!!! Your home looks lovely, Nicole! 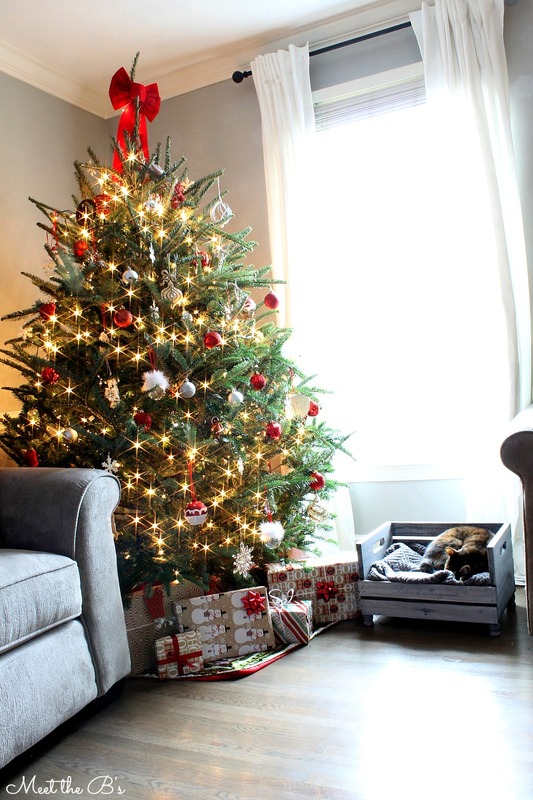 Your tree is gorgeous, and I definitely agree that you don't have to spend a lot of $ to have a festive and welcoming holiday home. Thanks so much Amy! I agree, affordable can still be welcoming and fun! Thank you so much Kendra! Thanks for putting together this tour! Nicole, your home looks amazingly beautiful dresses up for Christmas! I absolutely love your Christmas Tree! Thanks so much for sharing it with us! Beautiful job, Nicole! I LOVE that giant clock! Hope you have a Merry Christmas! Thank you Jamie! 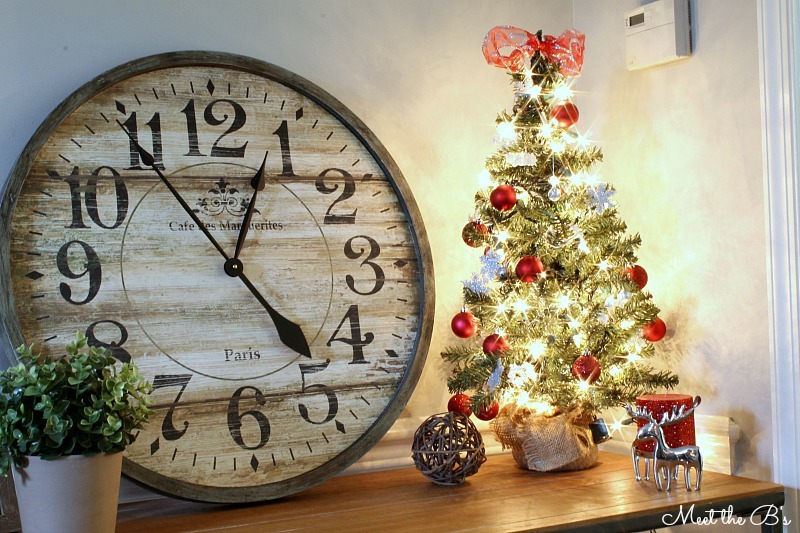 The clock is from World Market! !